With its swank vibe and überchic décor, Balliceaux reigns supreme with voters for the second consecutive year as the bar with all the right moves. Seriously, this place is worth the six or seven circles you'll make around the block trying to find a parking spot. Everything from delectable truffle fries to top-notch cocktails from mixologist Sean Rapoza and team hits the spot. Did we mention the eclectic sounds of the back room? Almost any night of the week, you can take in wide-ranging entertainment, whether it's band sounds or spins by eclectic DJs. National touring acts such as Dirty Bourbon River Show dig this cozy joint so much, they make repeat appearances in a year's time. 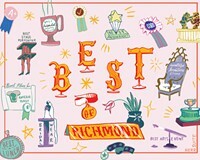 Voters also prove that Richmond remains a formidable force de brew with the beer-cheering brigade of Capital Ale and Mekong and their huge selections.